I am so happy that I have not lost the joy of writing. I don’t mean just sitting in front of a computer or iPod tapping out my thoughts with the luxury of cutting, pasting and editing in a flash. 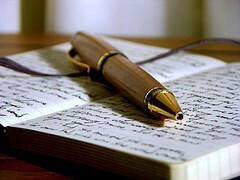 There is something incredibly special about holding a pen in my hand and letting the spirit flow from the Master, through my body and then out through my fingers into this instrument — landing beautifully on a blank page as the launching pad for my personal thoughts and life experiences. I love to journal a thought or feeling then go back a year or several years later to re-experience the feelings I had in that past moment. I have learned so many lessons about myself in having done that. Just as the art of reading is slowly dying in this instant/drive through world of ours, so too is the art of REALLY writing — yes – on a piece of paper with a pen or a pencil. I admit that being a BOOMER I am an “Old School” kinda girl. I love old houses with real character – not those big boxes that are thrown up in a couple of months with faux bricks on its face. Real molding and real wood floors are a WOW factor for me. As in REAL writing – it’s about character and strength and about using the full body experience to transfer thoughts from my inner out to the world. I still write letters and send cards and love just as much to receive a letter or card in the mail — being able to hold a friends energy in my hand for a long while. I trust that our beautiful world will not become automated to the point that we no longer are able to truly feel the spirits of each other – through conversation (not texting), through touching (not Facebook), through “writeful” communication that so swiftly is becoming a lost art. I am holding on to it as tightly as I can – even as I sit here plucking away at this cold machine – trying my best to transmit some of my spirit to your spirit on this invisible page.